left to right: Orlaith Curran, programme co-ordinator at the club, Brian Delany, Chairman Juvenile Section, and Darragh Sheridan, Croke Park. The Clanna Gael Fontenoy club is both pleased and proud to have been selected by Croke Park as just one of 10 locations nationwide for a national pilot programme called Play to Stay. With research showing that a high percentage of players tend to stop playing Gaelic games between the ages of 12 to 21, this pilot programme aims to explore new ways of ensuring that as many people as possible opt to ‘play to stay with the GAA.’ The selection of Clanns is unique in that it’s the only one in Dublin and is actually the only club selected – all other centres are schools-based. Starting on Friday 26th September and running for 24 weeks thereafter, the programme will be delivered at the club and at each of the other nine Super Games Centres throughout the country. Each centre will run a one-hour session of games each Friday evening for boys between the ages of 12 and 16. It is intended to expand the programme for girls in due course. So our club looks forward to welcoming participants from all over the city, including those who have yet to play gaelic games and those who have but have already dropped out for whatever reason. Further information about the initiative is available at www.gaa.ie/playtostay and information about free registration to participate at Clanna Gael Fontenoy is available from orlaith.curran2@mail.dcu.ie or phone 087-2124370. 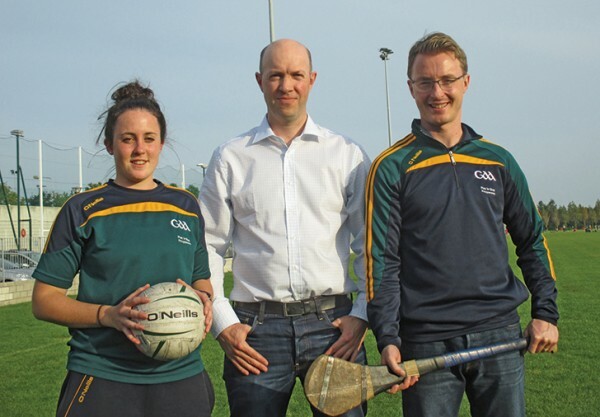 Launching the ‘Play to Stay’ programme at Clanna Gael Fontenoy, left to right: Orlaith Curran, programme co-ordinator at the club, Brian Delany, Chairman Juvenile Section, and Darragh Sheridan, Croke Park.